Trico Products rollforms and stamps blades for its beam-style windshield wipers from prehardened spring steel. I’ve noticed them, and maybe you have too—what the automotive industry refers to as “beam blades,” relatively newly designed steel-blade wipers that distribute all of the force on the wiper arm to the middle of the unit. The curved spring-steel blade, says manufacturer Trico Products, is bonded to the length of the rubber wiping blade. The design creates infinite pressure points and continuous pressure across the length of the wiper. Compared to the conventional wiper design most of us grew up with (a pivoting U-shaped shaft accompanied by smaller pivoting shafts that held the rubber blade via two springy steel strips), windshield cleaning and durability is vastly improved. 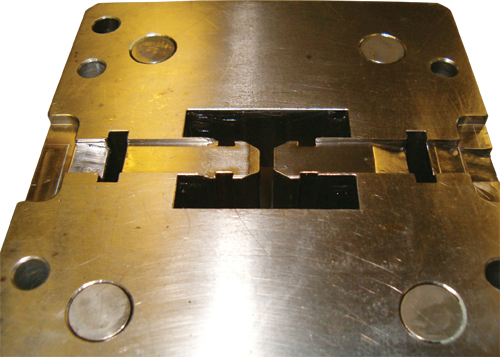 A pair of small-bed stamping presses pierces and cuts-to-length rollformed shapes to fabricate the spring-steel beam blades. 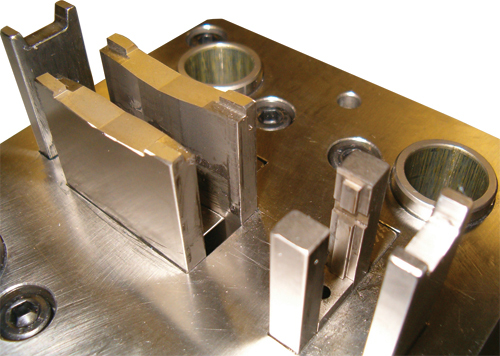 Tooling (shown here) is of Erasteel ASP 2015 powdered-metal high-speed steel, machined from 2.5-in.-thick blocks, heattreated to Rc 63-64 and wire-cut to final dimensions. All of this benefit to the consumer does not come easy at Trico Products, however. To achieve the properties needed in the beam blade, the firm must fabricate the blades from prehardened spring steel—no simple task. Typically, spring steels are supplied in the annealed condition for forming; hardened strip is more suitable for flat components. When Trico introduced the newly designed spring-steel blades to the market in 2007, it employed a sophisticated (and costly) heattreating process to achieve the required blade curvature with the prehardened spring steel stock, uniquely specified to match the curvature of each OEM’s windshield. Early in 2010, Trico’s Brownsville, TX, manufacturing facility (and North American headquarters) invested in a new manufacturing line to turn out the beams. As described by Trico process engineer Ramiro Pena, the new process begins with rollforming spring-steel strip to shape. After rollforming in a continuously fed line, formed strip runs through a pair of small-bed one-hit stamping presses for hole piercing and cutting to length. “The line runs 12 hr./day, 7 days/week,” says Pena, “producing some 20 different part numbers. Compared to the previous process (heattreating the curvature into the blades), the new process is five times faster and 30 percent less costly.” The facility, certified to Ford Q1, TS16949, and ISO 9001 and 14001, ships beams to a sister plant in Mexico for paint and assembly. Trico contracted with German suppler Felss GmbH for the rollform line, and then turned to tool-steel suppler Eastern Tool Steel, St. Marys, PA, for powdered-metal tool-steel punches and dies for use in the two stamping presses at the end of the line. Felss manufactures single-station machines and transfer lines for cold forming of solid and hollow (tubular) workpieces. “When the line first launched,” says Pena, “we ran punches and dies (8 by 8 in.) machined from M4 tool steel, and they couldn’t stand up to the hardened spring steel. The tools prematurely chipped and dulled, causing excessive burrs on the blades. We were servicing the tools every 4000 hits or so. Within a few months, we knew we needed to change tool steels, and Eastern Tool Steel recommended the powdered-metal AISI T15 grade (ASP 2015 from Sweden-based Erasteel, with U.S. operations in Romeoville, IL, and Boonton, NJ). “We machine the blocks (2.5 in. thick), send them to ETS for heattreating (to Rc 63-64), then wire-EDM to final dimensions here,” says Pena. According to an Erasteel datasheet, ASP 2015 (12 W, 5.0 V, 5.0 Co, 4.0 Cr, 1.55 C) most commonly finds use in endmills, hobs, cutters and broaches. It’s delivered with a soft-annealed hardness to 260 HB, and cold-drawn hardness to 300 HB.